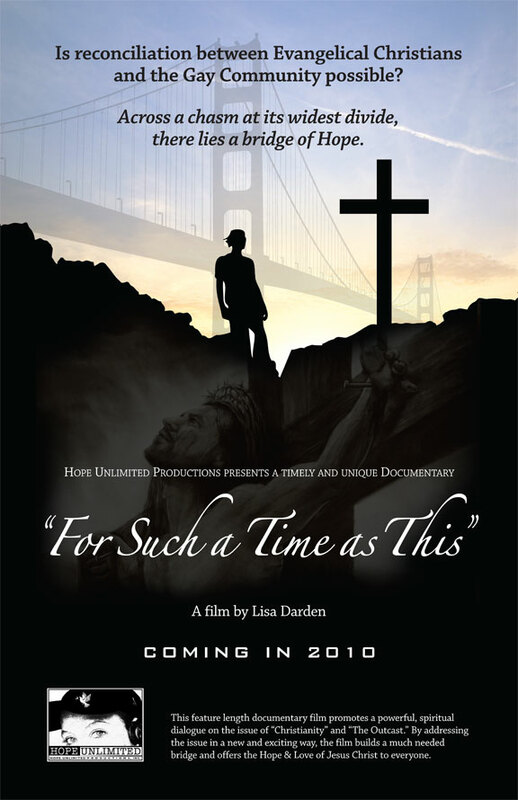 From the Director: Lisa's Updates on "For Such A Time As This"
Whosoever Godcast features Lisa Darden and "For Such A Time As This" - Download here! Is reconciliation between Evangelical Christians and the Gay community possible? Can common ground be found in the intense culture wars that have consumed our nation? Our documentary film entitled, "For Such A Time As This," seeks to answer these burning questions. Central to evangelical efforts to reach out to the Gay community are ex-gay ministries that encourage people to pray and help them not be gay. For Such A Time As This explores the issue by interviewing key players from both sides of the growing divide. This film offers a compelling and comprehensive inside-view and illuminates the issue as never before. We aim to turn ignorance into understanding and transform prejudice into promise. If you believe that the Love of God is available to everyone and that the ground at the foot of the Cross is level than this is a project that you will be able to wholeheartedly endorse. Post-Production is underway, with interviews and comments having already been contributed by nationally known actors, theologians, ministers, authors, comedians and professionals from all walks of life. A major fund raising effort is underway for completion funds for the film and the 2 CD Soundtrack that will accompany the documentary. Please help us bring this much needed and anticipated Documentary film to fruition and please encourage others to help. Del Shores, Playwright/screenwriter of 'Southern Baptist Sissies' and 'Sordid Lives'. Leslie Jordan, aka "Beverly Leslie" from 'Will & Grace'. As this Holiday season approaches we offer you our sincere thanks for your prayers, help and support. This has been a miraculous year for us at Hope Unlimited Productions we have accomplished so much and our greatly anticipated documentary, "For Such A Time As This" , is nearing completion. We have finished the principal filming, selected the songs and other music and the writing of the script is in its final edits. ability to use the music of choice. Please pray with us for God's guidance. It is quite an experience putting a film together. It requires the cooperation and good will of scores of talented people and the prayers and support of friends like you! As we move into the final tasks of the film editing, sound editing, synchronizing of the film and sound, titles, master prep and lock, plus the voluminous attendant reporting required by all the music, film and copyright agencies, we are in need of completion funds. Please give, help us finish the work, and please pray for God's guidance as we complete this amazing project so that all of our voices may be heard. If you have ever thought that you would like to help change the world then this is an excellent opportunity for you to do so. To make a Donation, please click here and make a monthly or a one time donation. If you are not comfortable donating on line please mail your check to Hope Unlimited Productions at P.O. Box 1440, Frederick, MD 21702 or call 301-682-7858 and we can take your credit card over the phone and mail you a receipt for your generous donation. We truly appreciate anything you can do to help us. Know that you will be included in the films credits for your donation. Please do not hesitate, the time is at hand as we have all been called, “For Such A Time As This”. We Pray For God’s Blessings For All of You! Have a blessed holiday season. Hope Unlimited Productions to meet with Lionsgate in early July. 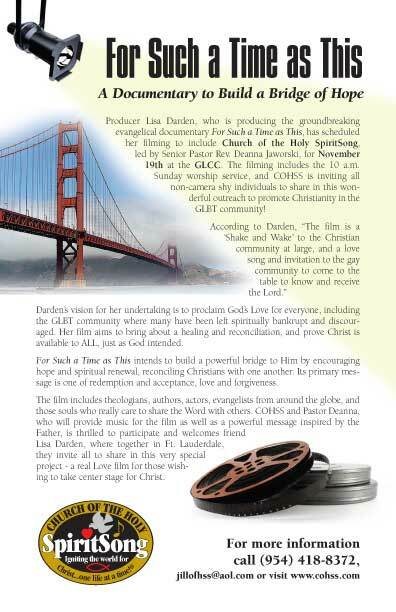 "For Such A Time As This" and Lisa Darden to be featured as 1 of 4 films/filmmakers at "Beyond Ex-Gay" in Irvine California June 29-July 1st. Please visit www.beyondexgay.com to find out more about this very special event. As The heavens begin to open and a new day dawns for many people who have been left out, left behind or gotten lost along the way....There is Hope! Hope that is Unlimited and available to all of God's creation. We hope today you will stand up and be counted and know without any doubt that you are loved by God! The new film poster of FSATAT is ready and can be seen here soon. Many thanks to Steve Whitehead from COHSS in Ft. Lauderdale. Thank you Steve ! It looks fantastic! We will be selling Film Posters and Hope Unlimited Productions and FSATAT items soon on the site. Stay tuned for the HUP store site. After the film has made its way through the film festivals we will have DVDs and the much anticipated sound track available. It will be available on the web site and we pray throughout the world at many locations in 2010. We have a new feature on the Hope Unlimited Productions website ..it is the DONATE Button. We encourage you to help us finish the film and get this project out to the world where it belongs. We need your help and ask that you pray about a one time donation. Please help us see this vision through to completion. Every donation counts and you will be given a credit in the film for your generous contribution. We will accept Visa, MC and American Express here or you can mail a check to P.O. Box 1440, Frederick, MD 21702 or you can call and we will accept your donation over the phone and process it that way if you are not comfortable donating on the web; the number is 301-682-7858. We can also accept Discover by phone. Thank you so much for your love, prayers and constant encouragement and I look forward to a day when we can learn to treat one another with dignity, love and respect at all times and in all places. God is no respecter of persons and in Christ we are neither, Jew nor gentile, black or white, slave nor free, gay or straight, we are all one in Christ Jesus. These articles are about the upcoming event in Palm Springs, CA Nov 11th 2006 with pastor and organizer Dr. Nick Warner with Evangelicals Concerned and company called 'Love Breaks Out'~Great stuff! All of the people speaking are being featured in the Hope Unlimited Productions Documentary "For Such A Time As This" ...hoping to coordinate a fundraiser for the film in conjunction with this event with 'dynamic duo' Nick and Claire Jordan Grant. It's going to be very special! I have incredible footage and have decided that after the film is finished to complete a series in an effort to continue our work and get all of these amazing stories out there. I’ve gone from filmmaker to historian in less than a year. We have quite an archive. I will interview Kate Clinton on Tuesday in NYC this week. Then will be with Michael Bussee, the mayor of Palm Springs Ron Oden, Nick Warner and Claire Jordan Grant next weekend and again in November at Nick's rally. Evelyn Shave in Houston is scheduled at the end of this month. I'm hoping Billy Jean King may be filmed next month. Deanna Jaworski and Jill, along with the Church of the Holy Spirit Song are scheduled Nov. 19th. The Mel White, Jeff Lutes, Chad Allan, Dottie Berry, Robbie Sapp, Lars Clausen, and Judy Shepherd footage from the Colorado Springs event is going to blow people away. The a capella duet with Cynthia Clawson and Marsha Stevens at EC in Portland is incredible. The Equality Riders filmed in VA Beach will make people cry and hopefully help wake them up. I've got some great stuff with Justin Lee from GCN ,Wayne Besen and many others. We'll be here all day if I tell you about all the amazing footage we have shot. This is just the tip of the iceberg! I will be in Colorado on July 22nd with Jeff Lutes, Mel White, Chad Allen, Billy Porter and Judy Shepherd and many wonderful, loving families who want to get their message out. If you can be there ...start making your plans. If not keep this in your prayers. With Gratitude, blessings and peace!